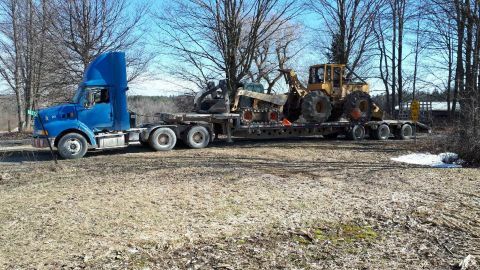 Huron Hauling & Excavating provides custom hauling for equipment and freight in Southern Ontario. Our fleet includes a highway truck and equipment/freight hauling step deck, 53’ tri axle trailer, farm tractors and off-road rock/gravel/brush hauling dump trailer. Contact us for more information or to obtain a quote on your custom hauling needs. Submit the form below, call us today at 519-292-0078 or email laverne@huronexcavating.ca.